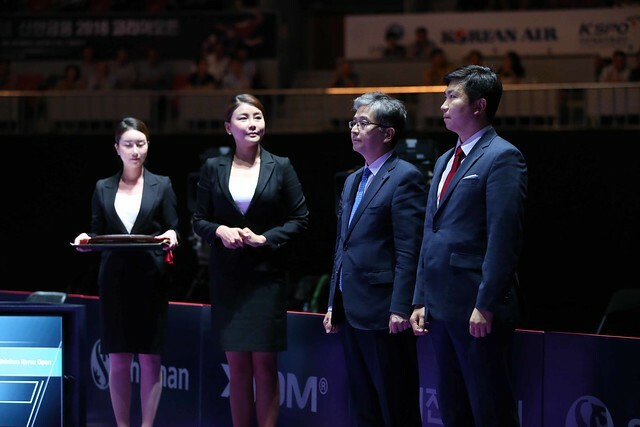 Impressive at the Liebherr World Team Championships earlier in the year in Halmstad but in Deojeon at the Seamaster 2018 ITTF World Tour Platinum Shinhan Korea Open, the host nation’s Jang Woojin has moved to a whole new level. On the evening of Saturday 21st July, he beat Japan’s Jun Mizutani, the no.10 seed, in five games 11-5, 11-9, 9-11, 12-10) to reserve his place in the Men’s Singles final. Awaiting in the final is China’s Liang Jingkun, likewise a player who was required to compete in the two day qualification tournament; just as Jang Woojin upset the seeding in the penultimate round, so did Liang Jingkun. He beat colleague, Lin Gaoyuan, the no.2 seed, in six games (11-9, 6-11, 11-7, 5-11, 11-6, 11-9). The defeat experienced by Jun Mizutani means that new names will be added to the list of Men’s Singles finalists at an ITTF World Tour tournament in the Korea Republic. Jun Mizutani won in 2009 in Seoul, after securing the vital last point against China’s Hao Shuai, he fell to the floor as emotion exuded from his body, it was a landmark occasion for the now 29 year old; it was first of the eight ITTF World Tour Men’s Singles titles he has won to date. Now for Jang Woojin, whatever happens on the concluding day of play for the young man born in Sokcho, Gangwon-do province, it is a landmark occasion. No player in the history of the ITTF World Tour has reached three finals. Yesterday, in partnership with Lim Jonghoon, he booked his place in the final of the Men’s Doubles event; earlier today he won the Mixed Doubles title in harness with DPR Korea’s Cha Hyo Sim. The finals’ programme is scheduled to start at 3.00pm (local time) in Sunday 22nd July; the Women’s Doubles gold medal contest is the first on the agenda followed by Men’s Doubles, Women’s Singles and Men’s Singles.